You may have noticed workmen and women poking about the Gustav Stickley house on Columbus Avenue last month. 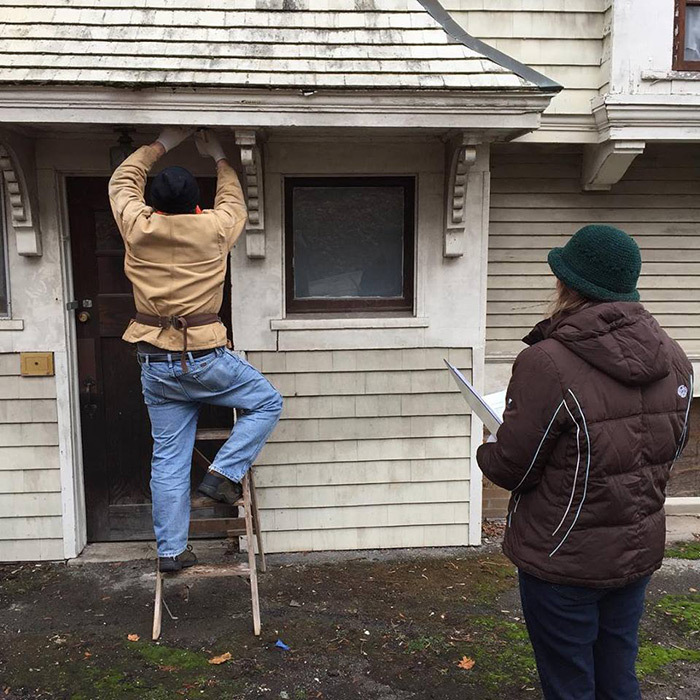 These were architects and conservators carrying out preparatory studies for the exterior of restoration of the famed residence, where the internationally recognized Craftsman Movement got its start. The house was built in 1900 as part of the development of the Rosenbloom Tract between Hawthorne and East Genesee Street. Designed in a late Queen Anne style by local architect Wellington Taber it was purchased by Stickley, who moved in with his family. Within a year, however, a Christmas Eve fire gutted much of the interior. 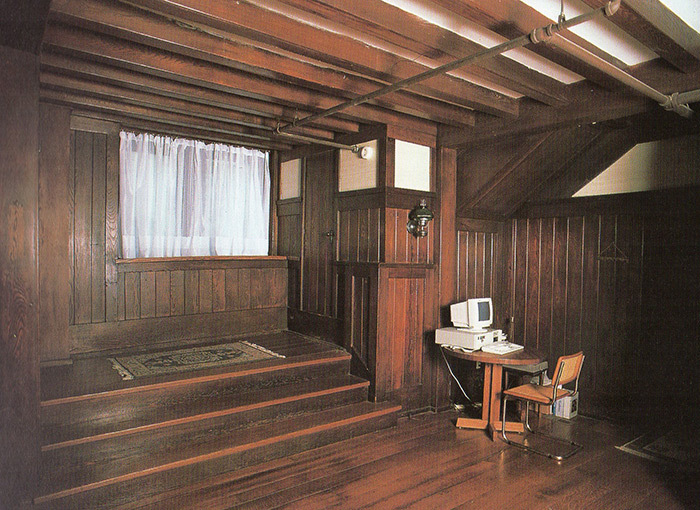 This misfortune then provided Stickley the opportunity to remodel the first two stories in accordance with his new interior design and furniture ideas. 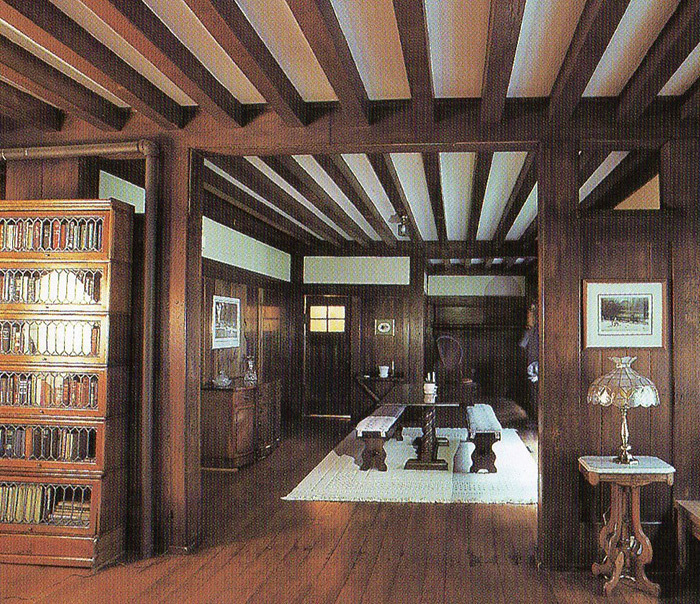 In the words of Arts & Crafts expert David Rudd, of Dalton’s Antiques, the interior “made use of rectilinear ceiling box beams and chestnut paneling to create a flowing sense of space, an unusual style at the time.” The new interior was immediately featured in the Craftsman Magazine in 1902 and quickly became an inspirational design for the growing American version of the English Arts & Crafts Movement. 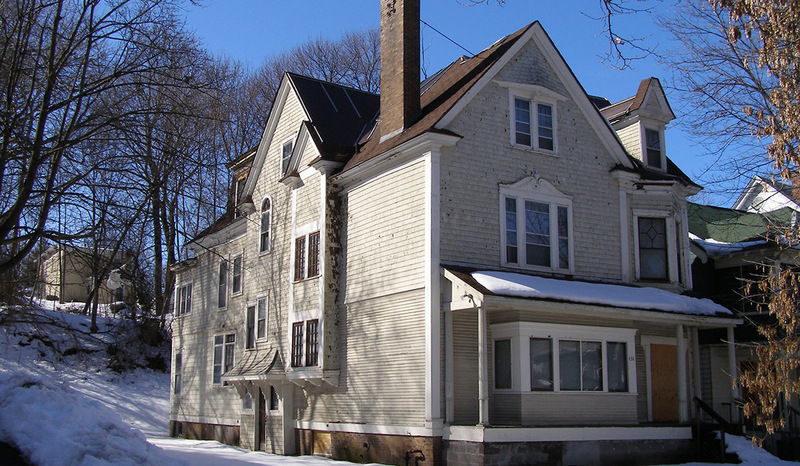 You can learn more about the house on our Westcott Neighborhood Walking Tours. The house served as apartments for much of the 20th century, including one for Gustav Stickley himself in his later years. In 1996 the house was purchased by the Audi family, owners of Stickley & Audi Co., the furniture manufacturers, in an effort to protect and preserve the house for posterity. Despite many efforts, viable plans for the preservation and use of the structure stalled. Then a few years ago, the Everson Museum expressed interest in turning the house into an Arts & Crafts Exhibition Center. Funding to start the restoration was obtained in grants from New York State, but even this effort was put in jeopardy two years ago when the Everson fell upon hard times and backed away from the project. In response – and desperation – a citizen’s committee was formed, including representative from WNA and other neighborhood groups, to save the project. Several months later the University Neighborhood Preservation Association (UNPA) and the Onondaga Historical Association stepped into the project with an alternative, but similar plan to that of the Everson. State grants have been re-negotiated and along with additional foundation funding, restoration work is about to begin on the exterior house. Local volunteer project development experts David Michel and Chris Capella Peters are leading this project for UNPA for the first phase. Crawford & Stearns are the architects. This is the team that successfully carried out worked on the Babcock-Shattuck House. Charles Tremper who has lived on the Columbus Avenue block of the Stickley House for decades represents WNA on the Committee. Many other organizations are involved as well as members of the Stickley and Audi families. UNPA will hold title to the property during the first phase restoration and then ownership will be transferred to OHA, which will develop the building as an Arts & Crafts Center. OHA also will create a specialized historically-themed residence where period rooms will be available to paying guests. Details on this, and all of the programming of the building are not final, and will be discussed, budgeted and developed over the next two years. Meanwhile, funds are in place for the complete exterior restoration and a foundation has been established to raise funds and provide guidance for the interior restoration, too. Read about the house in the Post-Standard and see recent photos here.